Thank you so much Ms. Polka Dot!! I really appreciate all of the wonderful things you had to say! 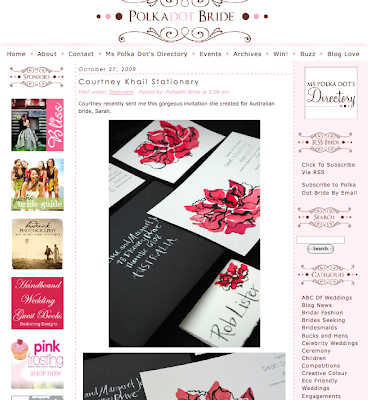 Everyone should definitely go check out her blog as well (great ideas, photos, etc), and if you happen to be an Australian bride, it is the place for you to find anything and everything you might need. It is so exciting to see people writing about what I do! Not to mention a fantastic way to start the day. Hope everyone's Tuesday is just as bright!